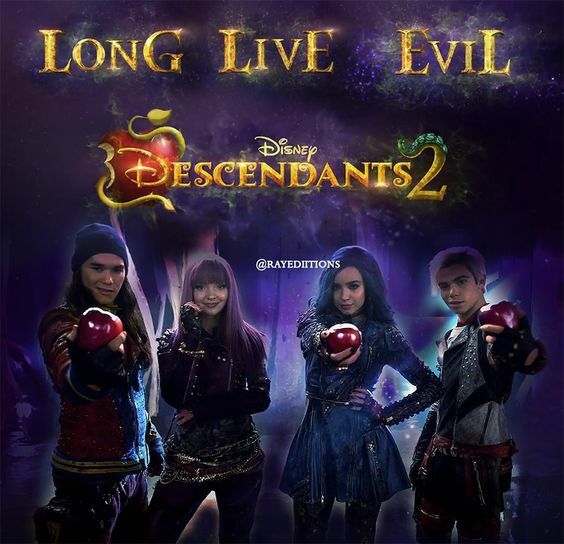 "Descendants " and "Descendants 2" are current made-for-TV movies, cartoons, and books made for the Disney Channel celebrating evil, wickedness, villainy, occultism, magic, witches, and other elements of the supernatural. Some of their mottoes are "Bring Back Evil" and "They're at their best when doing their worst." The story deepens in the music-driven sequel to the global smash hit Descendants, as the teenage sons and daughters of Disney's most famous villains — Mal, Evie, Carlos and Jay (also known as Villain Kids, or VKs) — try to find their place in idyllic Auradon. Songs played include titles like "Rotten to the Core," "Evil Like Me," and "Ways to be Wicked."